Their sound registers in a wave crashing on an empty beach; in the four-on-the-floor squeal of a tricked-out roadster; in a prom-night kiss. For more than four decades, their music has defined what it means to be young, to be ambitious, to be American. But how well do you really know the Beach Boys? Brian, Carl, and Dennis Wilson, along with their cousin Mike Love, and childhood friend Al Jardine -- better known as the Beach Boys -- rocketed out of a working-class Los Angeles suburb in the early sixties, and their sun-and-surf sound captured the imagination of kids across the world. In a few short years, they rode the wave all the way to the top, standing with the Beatles as one of the world's biggest bands. Along the way, Brian Wilson redefined what was possible in rock 'n' roll. A virtuosic musician and songwriter, Wilson's genius was most evident in the studio -- his experimental masterpieces, Pet Sounds and Smile, are among rock's finest achievements. Despite their utopian visions, infectious hooks, and stunning harmonies, the Beach Boys were beset by abuse, jealousy, and terrifying mental illness. 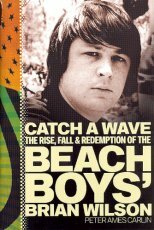 Now in Catch a Wave, Peter Ames Carlin pulls back the curtain on Brian Wilson, one of popular music's most revered luminaries, as well as its biggest mystery. Drawing on hundreds of interviews and access to never-before-heard studio recordings, Carlin follows the Beach Boys from their earliest days and explores their relationship with their demanding father, Murry, whose devotion to his children was curdled by his own insecurities. Carlin also chards the heartbreaking evolution of Brian's deepening emotional problems, which grew increasingly profound even as he was producing his greatest words. But Catch a Wave is more than just an affecting portrait of Brian's descent (and triumphant reemergence); it's also a celebration of Wilson's transcendent music and the Beach Boys' place in rock 'n' roll history. In this elegantly written portrait, Carlin delivers the definitive account of Brian Wilson's expansive genius and consuming madness. Thoughtful, provocative, and impeccably researched, Catch a Wave is the final word on one of rock's greatest visionaries and marks Peter Ames Carlin as an author of uncommon insight. You'll feel the vibration.